Sure, they know latte in Seattle. 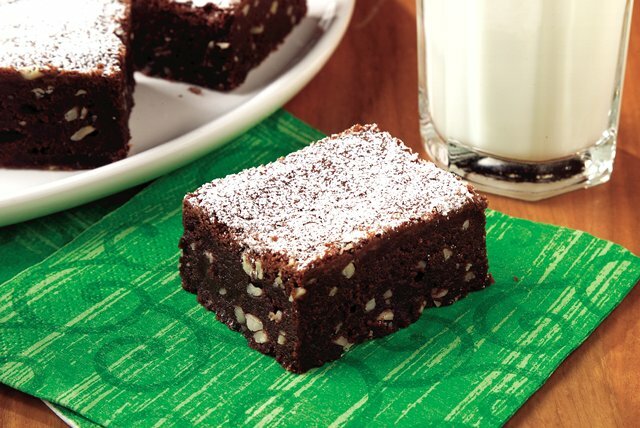 But you can make these rich, chewy, nutty, java-infused brownies wherever you live. Hence, you win. Preheat oven to 350°F. Line 9-inch square baking pan with foil, with ends of foil extending over sides of pan. Grease foil; set aside. Microwave chocolate, butter, water and coffee granules in large microwaveable bowl on HIGH 2 min. or until butter is melted. Stir until chocolate is completely melted. Beat in granulated and brown sugars with electric mixer on medium speed until well blended. Add eggs and vanilla; beat 2 min. Add flour, almonds, cinnamon and salt; beat until well blended. Spread into prepared pan. Bake 35 to 40 min. or until toothpick inserted in center comes out with fudgy crumbs. (Do not overbake.) Cool in pan on wire rack. Sprinkle with powdered sugar. Lift brownies from pan onto cutting board, using foil handles. Cut into 20 brownies to serve. Enjoy a serving, 1 brownie, of these coffee-laced brownies on occasion. This recipe make enough to serve 20. If baking in 9-inch square glass baking dish, reduce oven temperature to 325°F. Makes 20 servings, 1 brownie each.